Ren Walters (b. 1954) is a composer, guitarist, improviser and visual artist. Largely self-taught aside from some early lessons and short courses, Walters began piano lessons at an early age, moving to guitar in the late 1960s. Since 1971 he has been active as band leader, composer and performer in rock, jazz, improvised and free music, from Yellow Yachts (improvised), Millionaires (rock) and WildLife (jazz rock) in the 1970s, to Pyramid (fusion) in the 80s and TIP (contemporary jazz) and THAT (realtime composition). Walters studied guitar in New York with Mike Stern, 1983. He also has a diploma of fine art from Phillip Institute, Melbourne (1975). He has composed for and performed music for contemporary dance, film, video and multimedia. 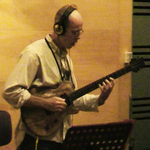 He also taught improvisation and performance materials, large and small ensembles and guitar at the VCA from 1995 to 1999. Walters was a member of the Australian Art Orchestra and its artistic committee in 1995. Ren Walters has travelled extensively (USA, Europe, South Africa) with own bands, solo and music theatre, notably with Indonesian/Australian collaboration 'The Theft Of Sita', performance highlights including EXPO 2000, the Brooklyn Academy of Music, London International Festival of Theatre and the Hebbel Theatre in Berlin. Walters co-founded music performance venue The Make It Up Club (improvised music venue in Melbourne, running for 13 years) contributed to Make It Now (Australia Council's Playing Ad Lib Initiative 2003); co-conceived and curated the Melbourne International Festival of Improvised Music (2004); and presented monthly music performances at LaMama in 2003 and Brightspace Gallery in 2005. Commercial CD releases include Start (1993), DeFlection (2006) and What's Left (2008). Walters has appeared on film, TV and CD recordings with Paul Grabowsky and Niko Schauble. He has performed, recorded and produced a catalogue of over 100 CDR titles with various artists, made promotional videos for Lyndon Terracini, and 'The Mizler Society' for the Australian Art Orchestra. Walters received the Music For The Future grant from ArtsVic to record BETWEEN (large composition/impro ensemble), co-funded by the ABC. In 2009 he won APRA Composers Commission award with a work for large ensemble Surrounded by C performed at the Melbourne Jazz Fringe Festival. In 2011, he started a curatorial organisation (General Assembly of Interested Parties) presenting improvised music/ multi-media events. In 2012 initiated CURRENT a two day event of music for trios (http://currentmusic-event.com). Created video for Crossing Roper Bar project with the AAO. Currently teaches improvisation materials at VCA and gives intermittent performances with friends.